I've often wondered why there aren't more crime novels set in the sporting world; sports spiderweb into the lives of so many people, in ways big and small, and there is so much passion and such an array of competing pressures and conflicting interests (and increasingly in recent decades, big big money), that it seems very ripe for well-written tales at the darker end of the literature spectrum. I was a bit slow on grabbing a copy of THE RULES OF BACKYARD CRICKET, the second novel from Ned Kelly Award-winning crime writer Jock Serong. I finally got to it this year, and man, was it a superb, nuanced read that blended crime and sport along with many other fascinating and authentically rendered themes (toxic masculinity, suburban life, coming-of-age stories, and more). I grew up playing cricket in New Zealand, it was my summer sport. I'd play it on various fields and corners of our school (on the concrete if the grass was too wet), in friends' driveways, in the 'nets' at a local park, and on the field on Saturday mornings. I was never a star, but I loved it. We'd play with full teams of 11-a-side, and as few as three people total, shifting the rules and parameters to fit (walls as back-stops, hit-and-run, six-and-out, shrubs as close-in fielders, one-hand-one-bounce, etc). So there was a lovely sense of nostalgia for me reading about the Keefe brothers growing up with cricket as a shared and antagonistic passion, how they'd get the backyard set-up for their games, how they'd get ultra-competitive with each other, imagining days when they would play at the highest level (my friends and I would commentate as if we were in a team alongside Martin Crowe, Sir Richard Hadlee, and international greats like Viv Richards, Ian Botham, and Javed Miandad). Serong captures that sense of antipodean suburban childhood brilliantly, in a very authentic and layered way. He writes in a literary rather than airport thriller manner, with prose that delights as much as the situations and characters it reveals. Darren and Wally Keefe are brothers, but in a Cain and Abel way. Brought up by a single mother in the suburbs, cricket is something they both excel at, driving each other to greater feats even as they try to tear each other apart in the backyard. Darren is the loose cannon, Wally the more circumspect. They both start elbowing their way into representative teams at a very young age, with plenty of success on the pitch and varying successes of of it. 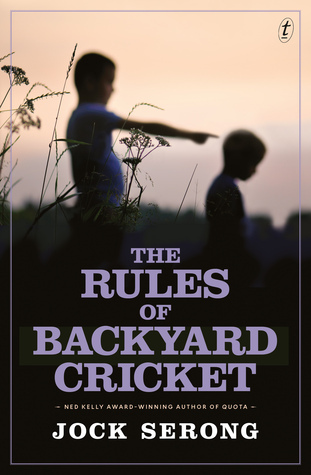 THE RULES OF BACKYARD CRICKET is an absorbing, brilliant read. It build and builds as we discover the path Darren took to being cable-tied and gun-shot in the boot of a car driving out of the city into the Australian bush. A place with plenty of space to bury bodies that'll never be found. There's plenty here for fans of cricket to love, with tales of on-field heroics and off-field pressures, as well as interesting insights into how the professional game is run, for good and bad. A peek behind the curtain, somewhat. But even if you're not a cricket fan or sportslover, I think anyone who likes a tense crime tale or just a good, beautifully written novel with superb characters and themes, will find plenty to admire and love between these covers. (Cover point and extra cover? Sorry, cricket joke). Serong delves into the myth-making around sporting heroes, the pressures put on players by themselves and everyone else around them, and the high stakes when a game is more than a game. He has crafted characters that ring so very true as individuals, while being symbolic of greater themes. THE RULES OF BACKYARD CRICKET triggered lots of questions for me as I read, interesting thoughts about life and the choices we make. What price success? How much do we really understand about what our parents may have sacrificed for us? How important is talent compared to maturity and application? How many chances should somebody get? Is it ever too late to repent? A brilliant novel that was deservedly shortlisted for the Edgar Awards this year, after being released in the United States. My advice: go and grab a copy, and slap it on top of your TBR pile.